The Fat Boy name arrived in 1989 and was all about one thing and one thing only; cruising. The raked-out V-twin behemoth was the definitive Harley-Davidson and was perfect for those wanting to ride at a more sedate pace, taking in the views with a thunderous two-cylinder soundtrack. Flash forward to present day and the Fat Boy remains a part of the H-D stable, with prices now starting at £17,545. 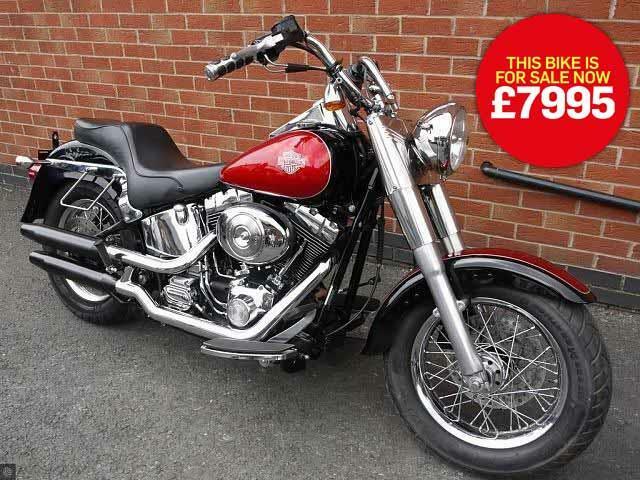 If this is a little out of your price range, then you will be pleased to know that used Fat Boys can now be picked up for as little as around £8000, with early bikes still capable of putting a smile on your face along your favourite weekend countryside jaunt. Although the base bike came with very limited features, as with all Harleys there was a thick optional extras catalogue to choose from, with few bikes leaving the production line completely standard. These genuine used accessories often help retain higher used values and help complement the gloriously deep paint and chrome finishes. The machine we have chosen below is in great condition, however is a late registration, meaning it misses out on the twin-cam 1584cc motor introduced in the year it was registered. Sellers Raceways Motorcycles, in Fleetwood, say: "For sale is this Harley-Davidson Softail Fat Boy. With a thumping 1450cc engine, this 2006 55-reg bike has done 16,720 miles and is finished in metallic red. "This bike comes fully-serviced and is in fantastic condition. It is great value, with three months warranty and part-exchange is welcome. UK delivery costs just £99 and low-rate finance and PCP is also available. There is also three years free legal cover with every bike purchased."